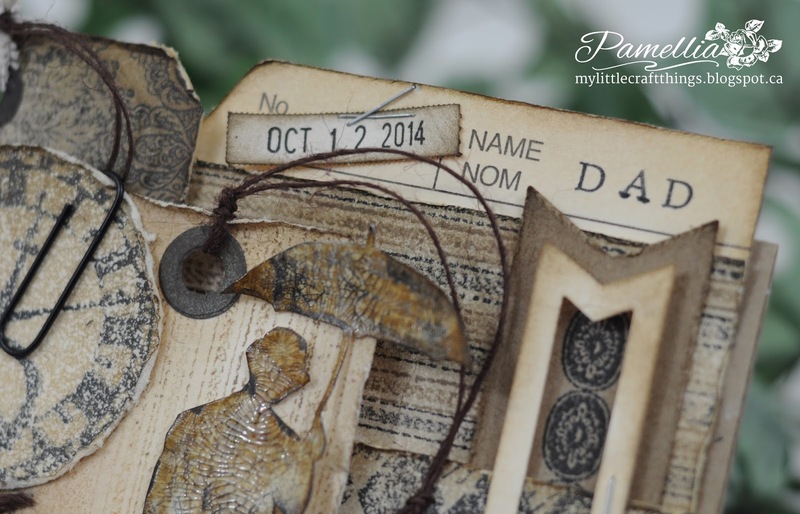 My Little Craft Things: Masculine Birthday - Tim Holtz Meets My Office Supplies! Masculine Birthday - Tim Holtz Meets My Office Supplies! Well, it's time for the ever-dreaded masculine card...ughh! I have such a hard time with these! How do you embellish when you can't use flowers, lace or pearls?? Well, I decided to go grunge because I just bought my very first Tim Holtz stamp set, YAY! It's called Life's Possibilities, one of the clear stamp sets. Craft Hoarders Anonymous has really inspired me with CHALLENGE #16 - WHO LOVES SCHOOL & OFFICE SUPPLIES. So I started scrounging around for everything I thought I could use. And so here is my 'Tim Holtz meets my office supplies masculine card'...hope you like it! Here are the office supplies that I have used on my card. The entire card is made out of a manilla folder, other than the kraft paper layers. I also used lots of staples, a paper clip, some reinforcement labels, some index folder label inserts and my date roller stamp. I normally use that roller date stamp for stamping invoices, but I might use more often, now that I know how crafty it can be. I used the tab from the manilla folder and one of the index tab inserts to make a name plate for the top of the card. The date is my Father-in-Law's birthday which I stamped using my roller date stamp. The base is made out of kraft paper. The striped background was made with a Rubbernecker background stamp using Tim Holtz distress inks Frayed Burlap and Black Soot. All my layers were edged with Walnut Stain. Two more index tab inserts, stapled on to my Fishtail banner die from My Favourite Things. The triangle stamp design is from Graphic 45 called Harlequin. 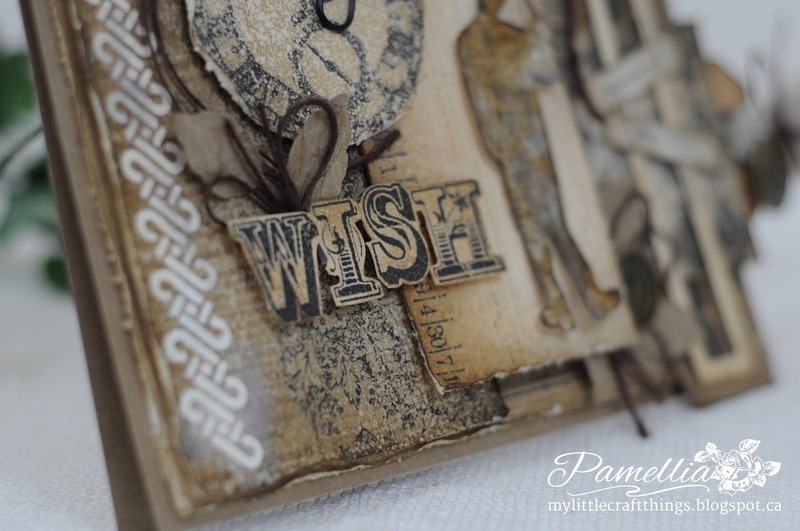 The WISH was stamped from a Fiskars stamp set called Make a Wish, which I stamped with Black Soot, edged with Walnut Stain and fussy cut out. The leaves are made out of kraft paper, cut with Spellbinders Foliage. 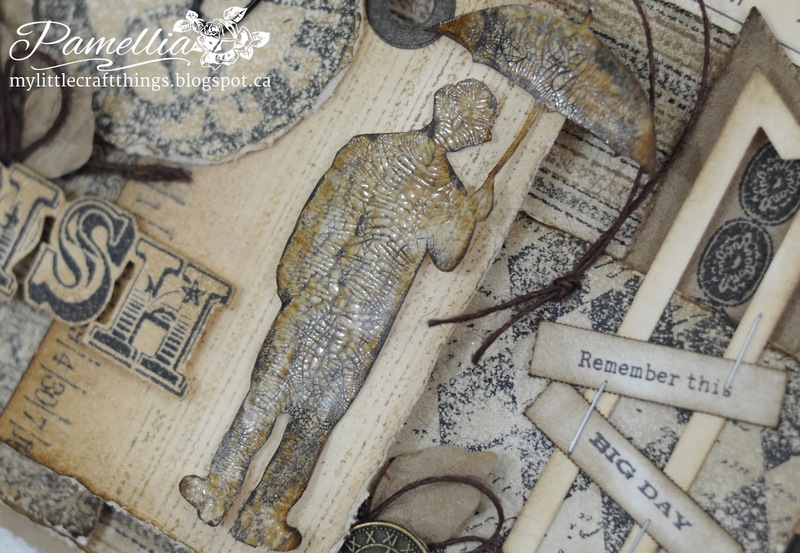 The large tag was cut from Tim Holtz Tag & Bookplates die. I stamped it using Rubbernecker Damask Background and Impression Obsession Newsprint background then applied some texture paste through a border stencil for some added interest. 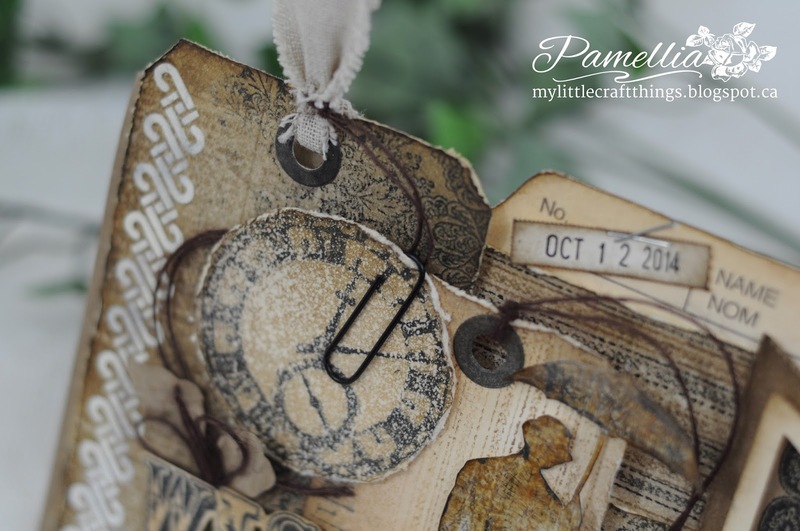 The clock is from my new Tim Holtz stamp set...yay!! The small tag was cut from Tim Holtz Tiny Tabs & Tag die set. The sentiment is also from the Fiskars stamp set. All my tags have hole reinforcement labels that I coloured with Staz-On ink. 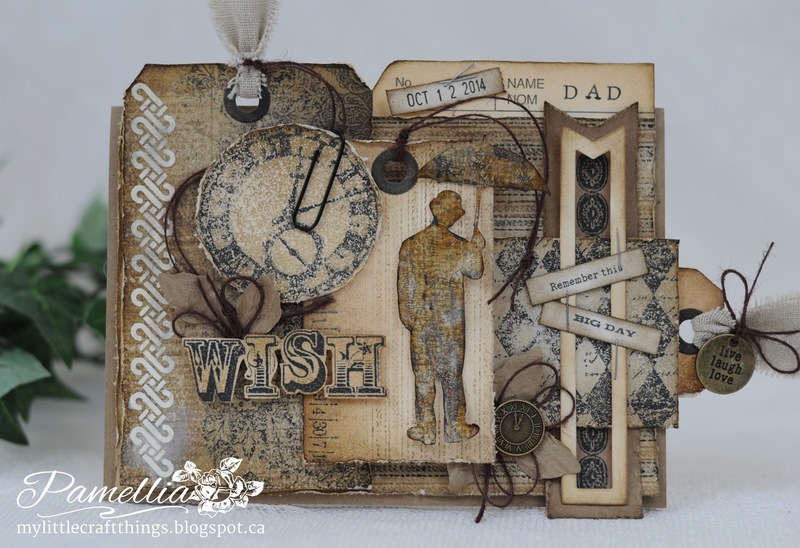 My focal point is from my Tim Holtz stamp set. Isn't he fun! 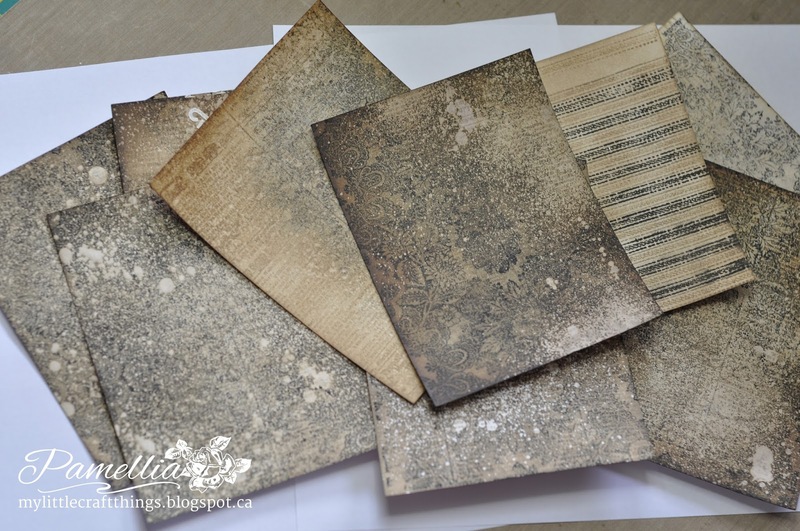 I antiqued him using Tim Holtz distress inks Frayed Burlap, Gathered Twigs and Walnut Stain and then coated him with Crackle Accents then applied Black Soot through the cracks for a real vintage look. That's it for my card, now it's "Poke-a-little-fun-at-Pam" time. Ever wonder why it takes me so frootin' tootin' long to make a card...well, here's why. This is an image of just some of the panels that I made and discarded because they weren't quite right. It's OK to laugh, I am fully aware that I have a problem. A slight touch of the it's not perfect disorder. It's something my hubby giggles about all the time. He likes to move things around and then see how long it takes me to notice that's something is out of place. haha! Funny guy! Gotta love him! Your background papers are perfect,don't you dare throw them away! 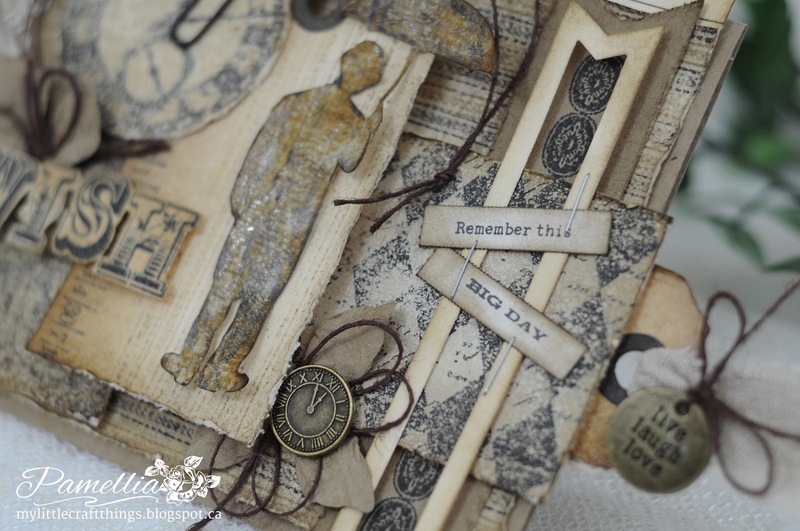 wow another stunning creation love all the grunge and distressing and great TH stuff-fabulous layering and great details and texture and those cast off papers are brilliant!!! I agree with Donna...is there anything you can't do. Your cards speak a different language! 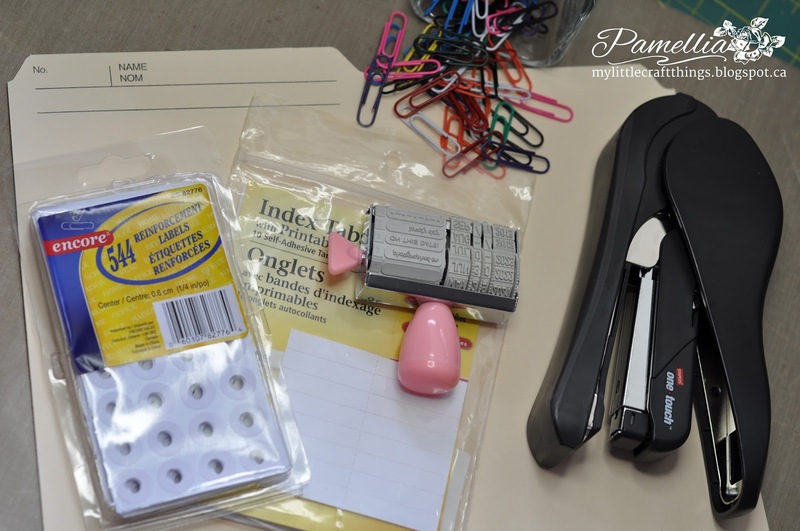 Love the grungy look and use of office supplies...only you can do it. Happy weekend dear. Oh I LOVE it Pamellia...and the title is so perfect!!! Well it sure seems that you concurred the old "masculine card"!!! You aced this one...the grunge style and all the embellies are PERFECT!! Well done...I bow to your AMAZING talent!! This is such a GREAT guy card but honestly who says you can't use flowers? All of my guy cards have flowers! LOVE all of the office supplies you incorporated and the crackle on the guy! Super FABULOUS card! As Always! Wow! You even make brilliant male themed cards and using office supplies. I am seriously impressed with this brilliant creation Pamellia, it's absolutely wonderful - I love all of the perfect details. Oh my Dear!! This is a pure fabulousity!! ;) love the colours, the grungy textures and all fun elements added! You don't need flowers! It's gorgeous!!! Already looking forward to the next one. Hi Pamellia, once again you have produced another outstanding project. An ingenious idea to use a manilla folder, which compliments the Kraft card and stamping perfectly. Hope you have a good weekend. Sally D.x. Wow totally amazing and so inventive. I will look at office supplies differently now. Have a great crafty weekend. Fantastic male card, the grungy, vintage look is brilliant. WOW what a perfect masculine card Pamellia!! Gorgeous colors and design, I love all of the office supplies you've used and the metal touches! Have a wonderful weekend! Must admit I'm not a grungy, steampunky kinda gal but you have done neat grunge and I can cope with that lol! Now I know why it takes you 15 hours to do a project. . . . .OPD, Obsessive Pamellia Distressing! Lol! 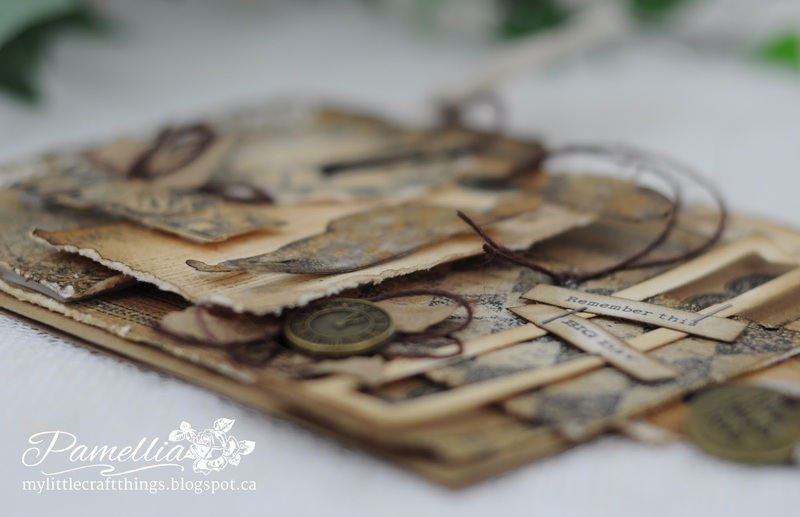 Stunning work, I love this project and all the supplies you used! Thanks for joining us at Craft Hoarders Anonymous! 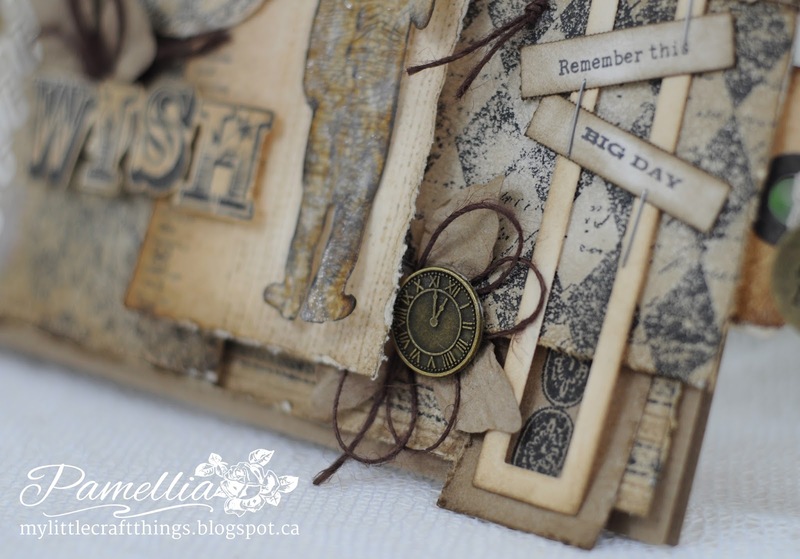 Wow and Wow again, Pamellia you have captured so much detail with all the grunge, i have never tried it myself as i know i would make a big mess ,however i do like to see what others have accomplished , well done . I love your card! So many wonderful layers and you used quite a few office supplies! Thanks for joining us at Craft Hoarders Anonymous! Fabulous! Love all your layering on this masculine project. You rocked it once again!! This is both unique and amazing ... fabulous design! I really like the vintage card - so many fabulous details. Love the tiny little metal embellishments! Great work. Thanks so much for playing along with The Male Room this week!! Gloriously grungy and delightfully distressed! I love the way you used your file folder here. And aren't they so much fun to work with?! I had to laugh...we have a lot of the same stamps in our stash, so that was fun to see. I love the wonderful tucked in tag, too, Pamellia! What fun! Thanks for sharing with us at Craft Hoarders Anonymous! Love this Pamellia, you do vintage/distressed so well. Love your masculine card and how you used all your office supplies. Thanks for sharing with us at Craft Hoarders Anonymous! Fantastic card, love the grungy feel, great masculine piece. Oh my a true work of art with fabulous details! Thank you for sharing with us at The Kraft Journal! I hope you will join us in our current sketch challenge. We would love to see your art again in our gallery! A totally amazing creation - great to see your starting point and all the steps along the way too. Wow, this is an awesome card. I love grunge, but do not do it well. You sure have achieved a fab masculine card with the office supplies. Great card, I love all of the layering and that fabulous frosted look you have created. How talented are you!Shabby chic,grunge ,mixed media and vintage.I bow before thee for your awesome talent.The card is so unique and love all the little details. I hate making male cards because I always get stuck for ideas but this is so inspiring! 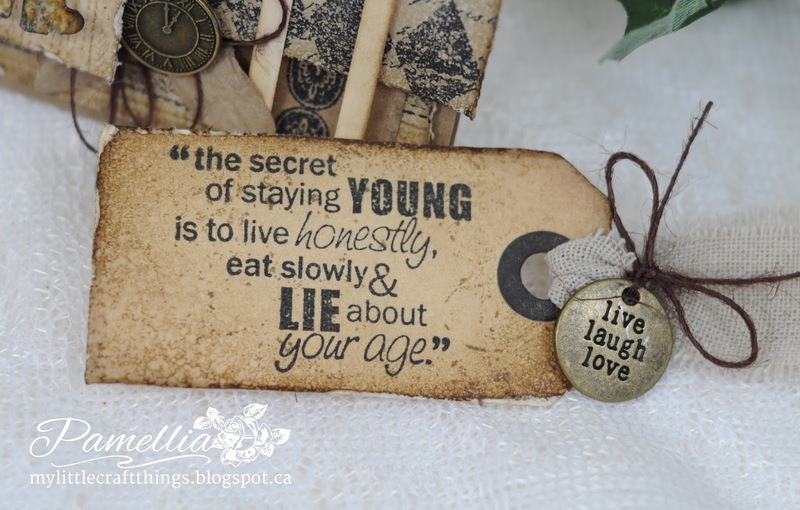 I love the grunge style and your office embellishments are so perfect for your masculine card. Such a fantastic masculine card! Love the vintage look. Thanks for joining us at Craft Hoarders Anonymous. Extraordinarily creative altered book....love every fabulous detail and use of all the office supplies. Thanks for sharing with us at Craft Hoarders Anonymous! I cannot tell you how much I love this! It reminds me of "back in the day" when we did not have all the fun supplies and bells and whistles and we HAD to shop in school and office supplies and be super creative with our items. This is just special and I adore it! Just....you amaze me! Thanks for joining us at Craft Hoarders Anonymous! Congrats to you Pamellia! This is a master piece!